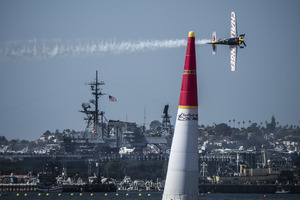 The Red Bull Air Race World Championship makes a welcome return to San Diego on the 15-16 April 2017. 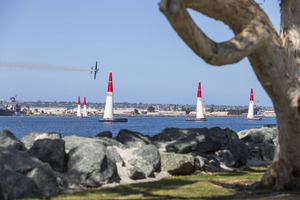 Set on the Pacific coast of California the location provides the perfect backdrop for a race. Thank you RBAR writer/reporter. All camera people too. WOW cracker run Mike ! Not sure why many of your comments didn't make it through yesterday but we are seeing plenty of them now! We really enjoy having you all with us and supporting your pilots so stay with us for the next few hours as we enjoy a full schedule! Now we go straight into the Challenger Cup! Watching from our hotel room on 7th floor of the Hilton Bayfront.. What a view from above the planes..
Good morming all from Melbourne Australia. It's clean and steady – 1:15.115 and that's 2s faster than yesterday! It's 1:09.383 for the German pilot Berger and that's faster than Coleman's Qualifying time! Now he's given the spectators some excitement with two pylon hits! Not great for his standing on the leaderboard but we all love to see those pylons get sliced! Coleman: "Florian put down a pretty good time and he's the man to beat." Hello, do you know when French pilots will fly? Hi to all RBAR fans! At what time starts the master class? We're checking if there are technical issues with the livestream – bear with us! GENEVEY: "The racetrack is really impressive but it was a bit hard for me to find my best lines. I hope I can do better in the next race." Time to beat at the halfway stage – Berger 1:09.383. "I had no penalty but found my flying a little sloppy. Let's see what Kevin and Luke will do." 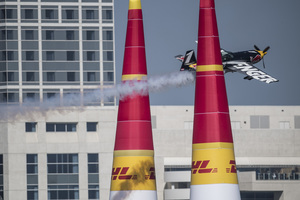 CHIANG: "My goal was to fly a clean race and I hit two pylons so it's a lesson learned. 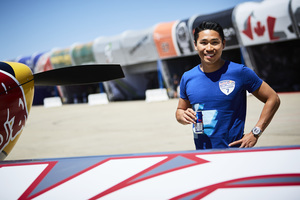 This is my first race so everything is very new to me." When is the stream going to start? Streaming seems to down in San Diego? And we're back in the track with Baptiste Vignes!